Paris, March 19, 2019 – Lectra announces the opening of its Innovation Lab, created by Philippe Ribera, Vice President Innovation, Lectra. The Innovation Lab is located in the heart of the company's technological campus in Bordeaux-Cestas. For Lectra, disruptive innovation cannot be conceived in isolation. The teams in the Innovation Lab work in collaboration with the organizations in their ecosystem: start-ups, research centers, customers and Lectra employees. Everyone can be invited to create a visual model during a design sprint or participate n an idea generation workshop. The first innovations resulting from these collaborations will serve the fashion industry. A strong principle guides the work of the teams: to rethink the entire value chain of this industry—brands, manufacturers, distributors—as it relates at each stage to the final consumer. This is reflected in various proof of concept (POC) demonstrations developed within the Innovation Lab. Thus, for brands, key aspects of creation or product development are reinvented through solutions based on innovative technologies. 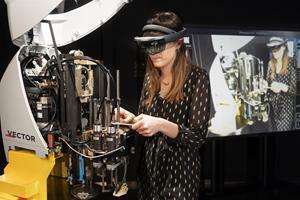 And for manufacturers, an augmented reality tool has been developed to support cutter maintenance. For companies that breathe life into our wardrobes, car interiors, furniture and more, Lectra is crafting the premium technologies that facilitate the digital transformation of their industry. Lectra’s offer empowers brands and manufacturers from design to production, providing them with the market respect and peace of mind they deserve. Founded in 1973, today Lectra has 32 subsidiaries across the globe, serving customers in over 100 countries. With more than 1,700 employees, Lectra reported revenues of $333 million in 2018. Lectra is listed on Euronext (LSS).